I’ve been saving plastic shopping bags and packing materials for quite a while now. I saw this idea at In My Own Style, and I was intrigued and had to try it. That’s right, I stuffed pillows for my front porch with plastic bags. Now, having done this, I will say I wouldn’t use this technique for the pillows on your couch. They’re crunchy sounding, and I imagine the plastic would compress quite a bit with heavy use. However, for my front porch, where they’re mostly decorative, it worked great. To make these, I used fabric that is specifically for outdoor use. My porch is covered, but I’m hoping they won’t fade as quickly. I made basic 18 inch squares, leaving a section open on one side for turning and stuffing. I found it helped to stuff a large bag in first with the opening sticking out of the pillow, then stuff the other bags inside that one. I didn’t just confine this to shopping bags either. I used flattened bubble wrap from shipping boxes. I even used the plastic packaging from some items we purchased, like toilet paper. Don’t tell my family that one. 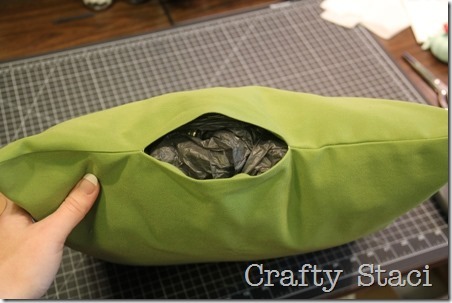 After the pillow felt poufy enough, I stuffed the bag inside and sewed it shut. I don’t know how long I can expect these to last, but they went a long way toward brightening up my front porch. I just might have to start saving up bags again so I can add more next year.